In early April, right as LME aluminium prices slipped below US$ 2000/tonne and heralded further falls, the U.S. Treasury Department announced fresh sanctions against Russia. The U.S. imposed sanctions against 24 Russian businessmen, striking at allies of President Vladimir Putin in a quite unexpected and aggressive move to punish Moscow for its alleged meddling in the 2016 U.S. election and other activities. Prominently on that list features Oleg Deripaska’s UC Rusal. Two weeks on since the April 6th measures, aluminium markets are shaken to the core: the LME price has soared by 35%, reaching seven-year high of US$ 2718/tonne (since May 2011), before falling again to US$ 2463 /tonne on April 20th. The impact of the sanctions has been so violent that many argue that they were in fact squarely aimed at UC Rusal. Last year, the Russian company accounted for more than 6% of the world’s aluminium output, and the resulting fears of supply shortages have led to record high prices, providing an unexpected boon to domestic U.S. producers. 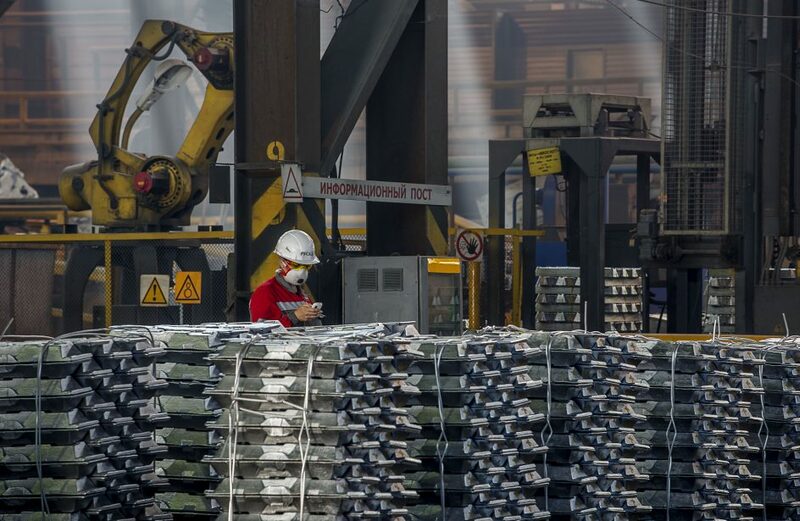 Out of a total production of 3.7 million tonnes, UC Rusal exports around 3 million tonnes of aluminium, almost half of which takes the form of value-added products. According to the company’s website, 18% of UC Rusal Q4 2017 sales were registered in North America, 19% in Asia, 18% in Russia and CIS and 45% in Europe. US Customs data shows that the US imported 695,000 tonnes of unwrought (primary) aluminium from Russia in 2017, to patch up an annual deficit of around 5 million tonnes of primary aluminium. Confirming just how dangerous and unsustainable this measure has been for world producers, the U.S. Treasury softened its stance on April 23rd and announced that it would extend by five months the deadline companies had to wind down their dealings with UC Rusal. The about-face came during French President Emmanuel Macron’s visit to the White House, a visit where, according to reports in the Financial Times, the fate of Russian aluminium was expected to feature prominently. At the time of this writing, LME prices had already retracted by 10% at the news. As of April 17, UC Rusal cannot deliver new metal into LME warehouses, after members complained that purchasing the Russian metal that was produced after April 6 could breach US sanctions. For the moment, the SHFE is still accepting metal produced by the Russian company. In the meantime, UC Rusal’s output has been reduced as a result of lower alumina imports and inability to sell aluminium and is stockpiling large quantities of aluminium at its warehouses. According to Goldman Sachs, a complete cessation of UC Rusal’s exports could lift prices to as much as US$ 3200/tonne. While the bank’s view is that UC Rusal will be restructured to bypass sanctions and allow both production and exports to continue, Goldman has nevertheless lifted its price forecasts to factor in the uncertainty. Indeed, according to Kremlin spokesman Dmitri Peskov, “temporary nationalisation” of UC Rusal is one of the options being discussed to keep the producer operational. Most of UC Rusal sales volumes are sold over contracts (so called off-take agreements), deals with traders and banks that guarantee supply of metal over a period of time at a pre-agreed price, usually based on the LME price and a previously agreed upcharge. About a third of total sales from UC Rusal go to Glencore, the highest individual buyer of its metal. With the implementation of U.S. sanctions, these sales agreements had to be frozen and Glencore has declared force majeure on deals to supply UC Rusal’s metal to consumers. Similarly, Japan’s major trading houses have asked UC Rusal to stop shipping aluminium for fear of falling foul of secondary sanctions. Japan imports around 300,000 tonnes of Russian aluminium per year, equivalent to around 16 % of its total import needs. Aluminium premiums have also reacted higher. In Rotterdam, the duty-unpaid aluminium premium was US$ 130-140 per tonne on Friday, April 13, up from US$ 105-115 per tonne earlier that week, Metal Bulletin data showed. Meanwhile, the duty-paid premium rocketed from US$ 164-174 per tonne to US$ 200-220 per tonne – the highest since March 2015. The hunt for non-Russian metal helped push the American Metal Market’s assessment of the U.S. Midwest P1020 premium to 22-23 cents per lb (US$ 485 – 508 per tonne) as of April 13, the highest ever – double January prices and up 18.4% from 18.75-19.25 cents per lb on April 6. Premiums for the Shanghai bonded warehouses rose by US$5 to US$ 130, the highest in 2-1/2 years. Aluminium billet premiums were mostly higher this month too, with Germany and Italy billet premiums climbing by more than 40%, the highest since April 2015. 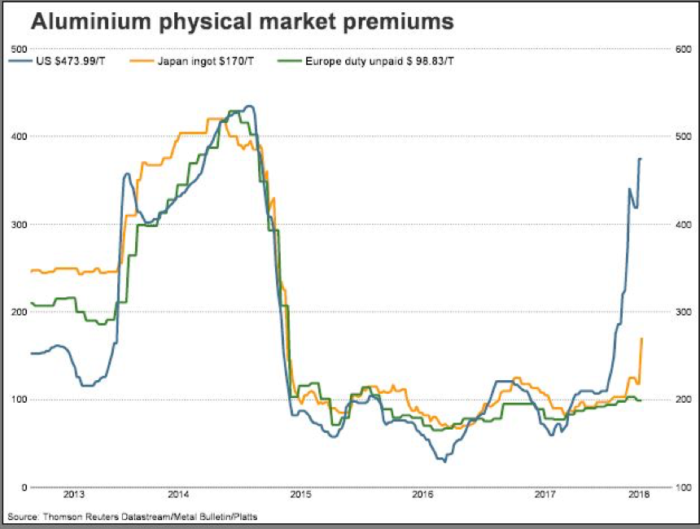 The premium in Germany for prime-quality billet delivered duty-paid on a spot basis into the Ruhr region with 30-day payment terms soared to US$ 560-600 per tonne from US$ 380-400 per tonne, its highest level since April 10, 2015. Next, the sanctions echoed across the entire aluminium supply chain, affecting not just aluminium but also the purchase of alumina, bauxite and other raw materials needed to keep production stable. UC Rusal is a major importer of coal tar pitch and anodes. The Platts Australian alumina daily assessment leapt US$ 160/t last week to US$ 710/t FOB, driven by acute supply worries. A 30,000 tonnes Brazilian parcel was reported to have traded last week at US$ 800/t FOB with 30 days credit, for shipment in early May. The sanctions on UC Rusal have escalated global alumina supply worries this month, adding to deficits already created by Alunorte’s unplanned output cut of 50% in Brazil since March 1st due to environmental breaches. Alunorte’s run cut is expected to remove about 240,000 tonnes/month of alumina from the market. UC Rusal produces alumina in Australia through its joint venture with Rio Tinto, at Queensland Alumina Ltd. In addition, the company produces alumina in Ireland and Jamaica, which is exported to third parties. Due to a severe lack of supply, sources said the price of alumina has escalated at a pace rarely seen. According to the traders interviewed by Platts, one said “The Rusal thing has thrown the market in chaos. It is not a normal market”.”It’s dramatic. There’s literally nothing available..smelters globally are on their knees…It’s an unprecedented situation in the global industry,” the second said. As supply fears grow, the market’s attention is turning to China as a potential source of aluminium supply. The LME price has risen much faster than prices in China, opening the possibility that China could begin to export metal and fill some of the supply gap left by UC Rusal. No doubt that the already significant aluminium deficit ex-China will only grow during the course of the year under these circumstances. CRU Group was already anticipating a supply shortfall of around 1.8 million tonnes ex-China for this year, before the sanctions. The potential loss of at least 220,000 tonnes of UC Rusal’s exports each month opens the way for exports from China, Middle East, India and Australia to fill the gap. Not so fast, however – due to China’s 15% export tax on primary aluminium, much higher prices will be needed (US$ 2900/tonne and over) for the Chinese metal to be exported and fill the supply gaps emerging in the rest of the world. Next, exports of secondary aluminium are still more attractive to Chinese producers as semi-products from China qualify for VAT rebates. What’s more, China’s output of primary aluminium has been decreasing: in March, it clocked in at 3.03 million tonnes in March, down 2.7% from a year ago, according to SMM. China’s output of primary aluminium in the first quarter was 8.76 million tonnes, down 2.5% y/y. 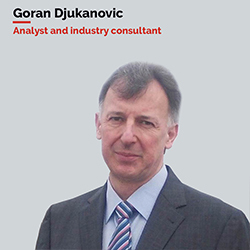 The main reason for the decline is the delay in both new capacity coming on stream and the reactivation of previously idled capacity because of low aluminium prices. U.S sanctions against UC Rusal, after the implementation of tariffs on aluminium imports in U.S., were more than a surprise for analysts and industry experts. By removing the world’s second largest aluminium producer from the market, even temporarily, the whole aluminium market entered a kind of state of emergency and force majeure. UC Rusal will most likely find the way to sell its metal at least on Asian and Chinese markets, though probably at lower prices. Major aluminium producers such as Alcoa, Rio Tinto, Hydro, as well as US-based companies and smelters will reap the most benefits, in both shares and profits. Growing stocks in Russia and China and expected higher production in China and exports represent a real risk for the price, once sanctions get lifted. There will be ripple effects as well. Other than UC Rusal, the automotive and aluminium can industries are set to experience the highest losses. The aluminium price is now twice higher compared to 2014, when the auto industry took major steps to replace steel with aluminium in order to reduce vehicle weight and meet emission standards. But even more dangerous for the continued use of aluminium in vehicles is the metal’s volatile prices. An all-in price (LME+premium) of over US$ 2500-2600 per tonne may represent an inflection point, when aluminium will lose its dominance as the fastest growing material in lightweighting vehicles. Until then, all-in aluminium prices in U.S. will remain higher than in the rest of the world (currently standing at around US$ 300 /tonne), thereby attracting more metal exports from regions and countries exempted from tariffs and sanctions.